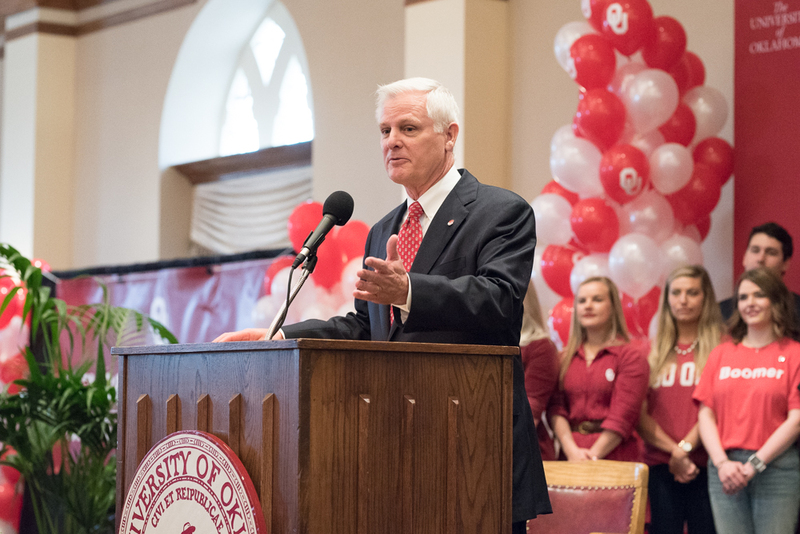 James "Jim" Gallogly speaks to a crowd following his introduction as the University of Oklahoma's next president in the University Memorial Center ballroom. By Jennifer Palmer, Whitney Bryen, Jeff Raymond, David Fritze, Trevor Brown and Paul Monies. The naming of a retired energy executive as the University of Oklahoma’s 14th president caught many observers by surprise. The assortment of names that had been bandied about publicly for months did not include James L. Gallogly, the 65-year-old former chairman and chief executive officer of LyondellBasell, a multinational plastics, chemical and refining company. But on Monday, the OU Board of Regents approved Gallogly (pronounced GAL-uh-glee), a graduate of the OU College of Law, as president with a $500,000 salary, with additional terms to be negotiated later. Gallogly, who lives in Houston, will start when OU President David Boren retires after the current academic year, which ends June 30. 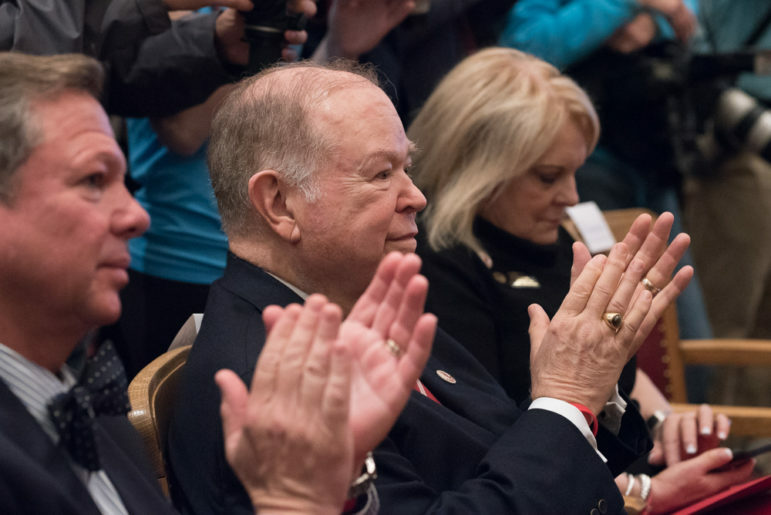 University of Oklahoma president David Boren applauds as his successor is announced in the University Memorial Center ballroom. Staff members at the university and regents have known about the selection at least for days. On Monday, OU rolled out a video interview with Gallogly and distributed tiny pin-on buttons with his face and one of several theme words, such as “Inspiring”, “Teacher” or “Visionary”. Gallogly, who goes by “Jim”, is a major donor to OU as well as to the University of Colorado in Colorado Springs, where he received his bachelor’s degree in psychology in 1974. For OU, Gallogly teamed with donors Peggy and Charles Stephensen for a $30 million gift that establishes a school of biomedical engineering, facilities and endowed chairs. Ground was broken a year ago on the $43 million Gallogly Hall, expected to open in fall 2019. Here’s a look at some aspects of Gallogly and his selection as OU president. Renzi Stone, OU regent and chairman and CEO of Saxum public relations, said the seven candidates the board considered came from various backgrounds: academic, nontraditional and internal to OU. Frank Keating, former governor and regent, said he and Gallogly became friends in law school. He said he and the other regents were hoping the search committee, with students, faculty and other appointees, would present them the best choices for the university. The committee interviewed 13 candidates and sent seven to the regents for consideration. None of the other candidates’ names were disclosed. OU regent and former Oklahoma Gov. 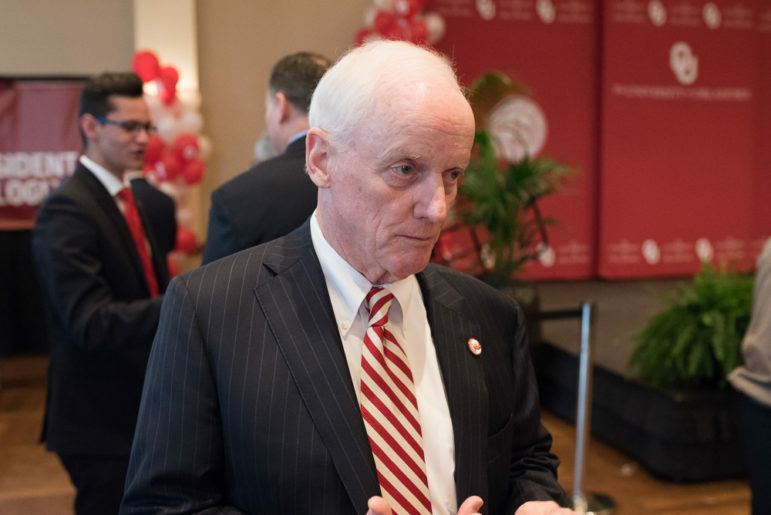 Frank Keating talks about why he believed James Gallogly was the best candidate for the job of OU president. Keating said his top priority was to find someone with a strong tie to Oklahoma. “The only candidate in front of me at least, who presented that vigorous, rigorous, no-nonsense, we’re going to make this not just an athletic powerhouse but the Harvard of the Southwest, was Jim Gallogly,” Keating said. What constitutes his vision for the university is unclear at this point. In the video interview, Gallogly suggested that his driving philosophy is: Set high expectations. At a Monday morning event on the Norman campus, Gallogly said he’s looking forward first to being a student and learning from everyone; second, to teaching; and third, to being an administrator. “I came with a vision … to take OU from a great institution to absolutely the pinnacle of success,” he said. What business success has he had? When Gallogly took over as CEO of LyondellBasell, the company was in Chapter 11 bankruptcy. According to a 2014 Forbes article, LyondellBasell had shed debt in bankruptcy and convinced a reluctant Gallogly to take over the struggling firm by offering an “attractive package” of restricted shares and stock options. Gallogly, who had led Chevron Phillips Chemical Co., saw an opportunity at a propitious time: The sudden shale gas boom had driven down prices on a natural gas-derived chemical that the company used to produce ethylene, the Forbes article said. He converted processing facilities to use the chemical in production. Lower costs super-sized profitability. The company’s stock price and bottom line soared. Gallogly had joined Phillips Petroleum Co. in Bartlesville in 1980 and remained after it was acquired by Conoco Inc. in 2002. By 2009, when he joined LyondellBasell, “I had managed every asset in ConocoPhillips portfolio,” working on legal matters, in finance and running the chemical business, he said in a 2012 speech. In OU’s video, Gallogly acknowledged that leading OU won’t be the same as running a business. 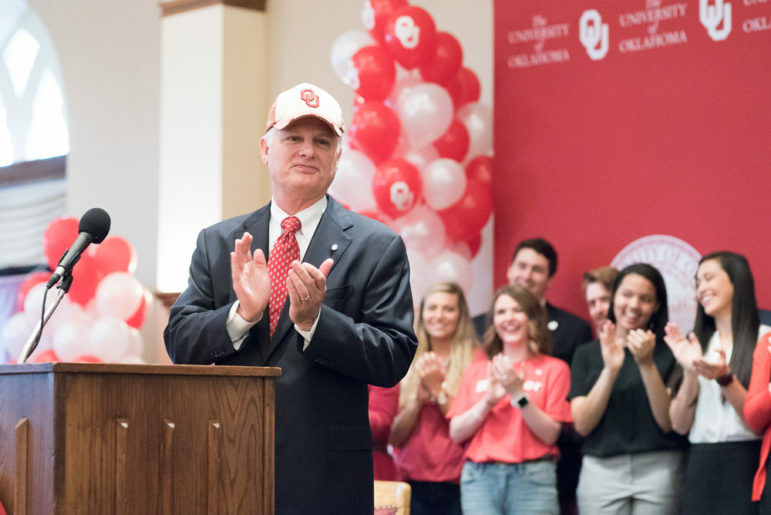 James “Jim” Gallogly speaks to a crowd following his introduction as the University of Oklahoma’s next president in the University Memorial Center ballroom. Does he need the job? Any job, of course, is about more than money. But Gallogly’s gamble with LyondellBasell paid off in spades with his compensation. 2015: $881,750 (partial year because he retired in January 2015). Gallogly has served on many boards, including currently on the board of directors of Continental Resources, based in Oklahoma City and led by Oklahoma native and OU donor Harold Hamm, and DuPont. Boren also served on the Continental board while OU president, receiving $71,000 in cash and $360,000 in stock in 2016. Information on Gallogly’s Continental compensation won’t be known until an annual filing in April. At DuPont, he earned $115,000 in cash, $150,458 in stock awards, and $300 in other compensation for service on the board in 2016, SEC filings show. 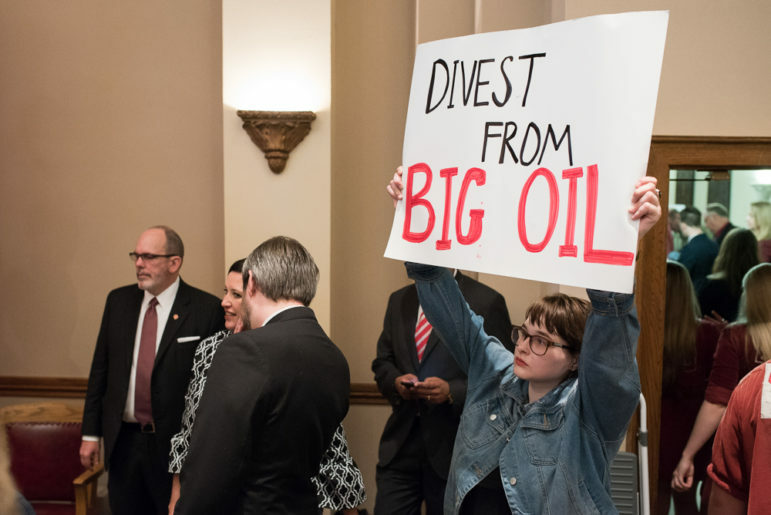 A protester holds up a sign following a ceremony announcing James “Jim” Gallogly as the University of Oklahoma’s next president in the University Memorial Center ballroom. What are major challenges ahead? One of the biggest challenges facing OU and other universities is declining appropriations from the Legislature. That has helped drive up tuition and fees and forced universities to pursue more private grants and federal funding, while cutting or restraining costs. From fiscal year 2010 to 2018, higher education appropriations in Oklahoma have fallen nearly 20 percent, from about $1.1 billion to $848 million. One of Gallogly’s roles will be to convince Republican political leaders that OU is worth public investment and brings economic dividends to the state. His party affiliation wasn’t available Monday, but Gallogly has donated more than $100,000 to a variety of largely Republican candidates and political action committees associated with companies where he worked. 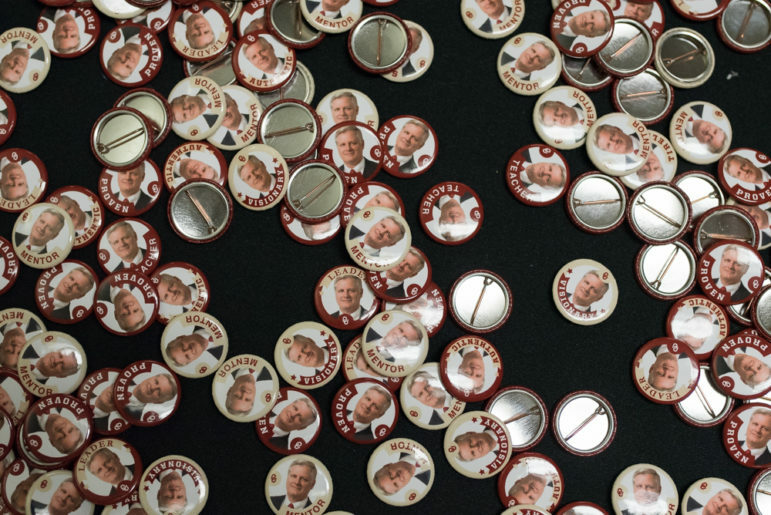 Buttons with James “Jim” Gallogly’s face are on a table outside of the University of Oklahoma’s University Memorial Center ballroom following a ceremony introducing Gallogly as the next OU president. Among the candidates he donated to were former House Speaker John Boehner, 2012 presidential candidate Mitt Romney, former U.S. Sen. Don Nickles, Democratic Louisiana Sen. Mary Landrieu, and the Republican National Committee, data gathered by the Center for Responsive Politics shows. Gallogly also donated $10,000 to Oklahoma’s Children, Our Future, which advocated for State Question 779, the proposed 1-cent sales tax for education promoted by David Boren that was rejected by voters. Many legislators were angry at Boren for leading the campaign. Other issues Gallogly will face as OU president: Whether to expand online education more rapidly; whether to continue Boren’s approach of spending significant “opportunity costs” on scholarships for National Merit finalists, many from out of state; balancing support of the “hard” science or commerce areas that defined his career and those of some big donors, like engineering, technology and business, with the “softer” fields, such as education, languages and social sciences; achieving a more diverse student body and administration; dealing with many Oklahoma high school graduates who are unprepared for college and need remedial courses; and navigating the free-speech political minefield on campus. And then, of course, there’s football. Gallogly was born in Newfoundland, Canada. He is one of 10 children of Tom and Margery Gallogly. He and his wife Janet have been married 43 years and have three daughters and four grandchildren.